Riding on our experience in the industry, we, as a Manufacturer, Exporter & Supplier of Semi Automatic Volumetric Liquid Filling Machine have positioned us in the upper echelons of the industry. Our distribution network allows us to facilitate quick and convenient delivery in a matter of time at your doorstep. Its dimensional accuracy and sturdiness makes it an interesting proposition. We offer the supreme quality at economical rates. 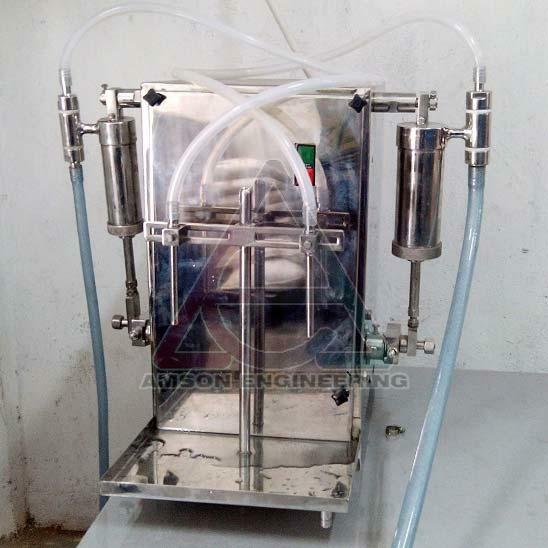 This semi automatic volumetric liquid filling machine, Model No: AEVMF021000 is two head, table mount type, semi-GMP model used to fill variety of liquids/oils. Semi automatic volumetric liquid filling machine can be used for filling different types of glass, Plastic, Metal containers. Any free flowing or partially free flowing liquids with comparatively low viscosity with volume filling requirement can easily and accurately filled with this machine. Output of this machine is very high as compared to Manual Hand operated machines. The main speciality of this machine is there is no human power is required to fill the bottle. The only job is to start the machine, and to place the empty bottles below the filling nozzle. All the other jobs like suction volume measuring and filling are done by this machine itself. Twin head machines in this series can fill two equal or different volumes at a time. If two peoples are doing the filling, then the output can be higher up to 8 fills per minute as per syringe size. The AEVMF021000 works on volumetric principle and is fitted with single/two syringes on both the sides. The motor and gear box are covered in a Stainless steel cabinet. The desired volume can be adjusted by increasing or decreasing the eccentricity of the cam provided with the machine. Bottles are kept bellow the nozzles manually. There is Stainless steel Syringes and Piston at both sides which do the filling. A non-return valve helps the control of flow towards and from the syringe during working. A Polished SS Nozzle is provided for both the syringes connected by pipes and mounted on height adjustable supports. The human labour is required to operate this machine is only one. The main switch is to be started to start the filling. Each filling is done at particular intervals. The bottles to be filled are to be placed under the fill nozzle after each filling after removing the filled bottles. Output 8 bottles per minute from each head depending on type liquid and fill volume. All the product contact parts are made of SS 304 as per material to be filled/ as per specification. Machine is made compact with sturdy internal frame structure. Complete machine frame is covered with stainless steel 304 quality sheet metal of good gauge and finished to mirror. All working parts like, motor, gear box, and shafts are inside the cover to avoid any danger. Adjustable fill volume by an eccentric cam screw rotation. Very useful for pesticides, oils, syrups, lotions etc. Settable fill volume by cam and screw. Gear Box - 60 - 1 ratio. Number of fill nozzles - 2 nos. No separate Hopper provided, Input of (Suction) liquid can be done from any vessel. Heating Jacketed Vessel of any capacity can be available as per order as optional. 1 single person can operate the machine. Change part Syringe (Compatible)available on order at extra cost, for different volume filling.